The cache is NOT at the posted coordinates (which are in the middle of Rt 1). You must completete the challange requirements ( 14 Caches) in order to log this cache. As of 12/10/09 there were 56 people that completed the Maryland and Delaware Delorme Chalenge, but only five cachers from Delaware. Tacklemom and Horn229 finished in 2007 and in 2009 JerseyJoey, Evanspack and MikeOtt completed the challenge. Apparently finding 53 chaches all over Maryland/Delaware which covers a lot of territory has not got very much attention from Delaware geocachers. Therefor this simpler Delaware only challenge was created that hopefully would encourage interest in other Delorme challenges. It is similar to a challenge for Rhode Island that shares a Delorme Atalas with Conneticut. This cache requires finding a geocache in Delaware for each of the 14 Delorme pages that contain Delawre territory. 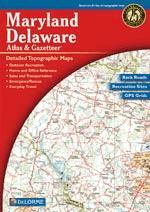 There are 7 pages that cover just Delaware and 7 pages that have both Delaware and Maryland territory. Each page coveres an area of 15.1 miles by 21.6 miles. Even if you have completed the Maryland and Delaware Delorme Challenge, you may need some additional caches to comply with the Delaware Challenge, but only if you only found Maryland caches on some of the pages that had both Maryland and Delaware territory. In order to claim this cache, you must first send me an email notifying me of your completion. Bookmark lists including cache name and map number are best. Also, make sure you bookmark the DeLorme Challenge Cache in your bookmark file so that it will show up on this page. As alternative post a screen shot of one of your profile statistic showing the completion of Delaware Delorme, such as using MyGeocachingProfile.com . Another way is to post in a log or send me a listing of the caches you are using to complete this challenge (include Map Page, GC#, Cache name, and date found). Once everything checks out, I will then send you the correct coordinates for the final cache! The find cannot be logged until the physical container is found and the logbook inside signed. 2. All cache types count for the DeLorme Challenge with the exception of Locationless (RIP), Event and CITO caches. 4. 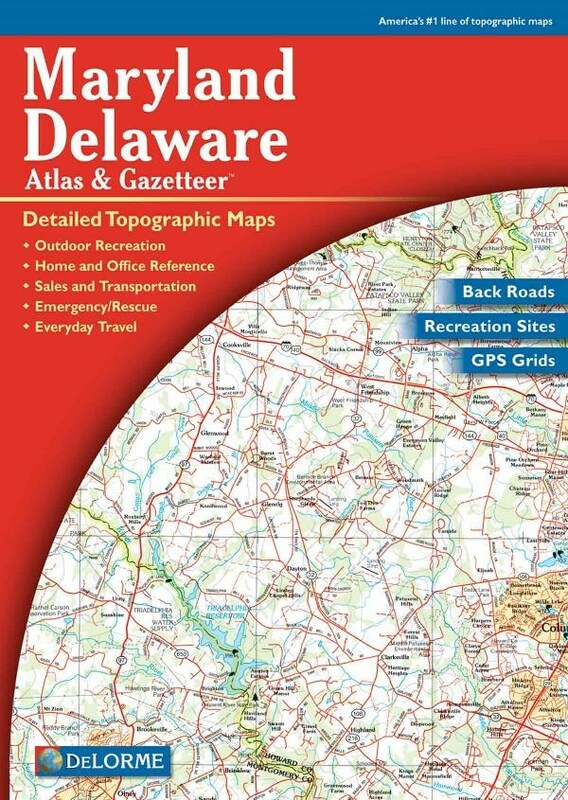 A cache in either of the two maps on page 62 (excluding caches that fall outside of Delaware) will satisfy that page. 5. While you may have others with you when you find the final cache, only those who have fulfilled ALL criteria for this cache will be allowed to log it as a find. 6. Previously found Delaware caches count, so you may already qualify to find the final. 7. When in doubt ask the CO for clarification. You do not need to purchase a Delorme. Print out the picture attached to cache page that shows needed parts of Delorme map. 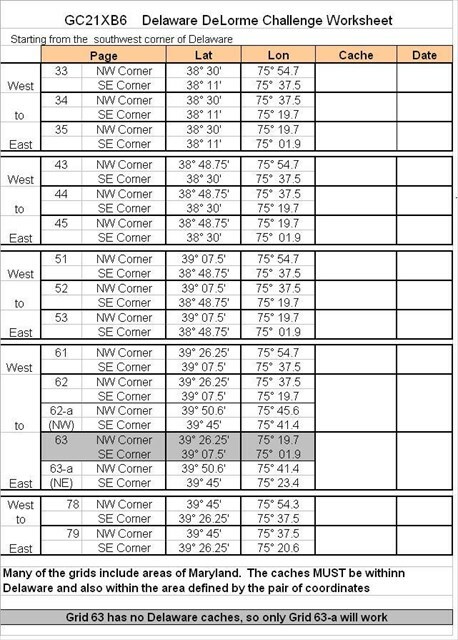 Also print out the list the coords of the grids that will confirm if a cache you are considering that is very close to a grid line is in the needee grid.